The Home Office: "La la la, we're not listening"
The Government's draft communications bill, which would give it and the police greater access to what you've been up to online, is to be re-drafted after a review found it wanting. 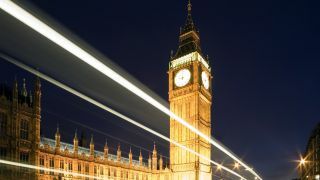 After a huge amount of pre-legislative scrutiny carried out by MPs and Peers from all the UK's major political parties, the proposed bill was roundly damned in its current form. A spokesperson for the prime minister said that Number 10 accepts the criticisms and will re-write the Bill. He said, "We recognise this is a difficult issue. We will take account of what the committee said." The Draft Communications Data Bill wants to force ISPs to store the who, when and where of all online activity, including email, instant messaging, social media activity, web browsing and VoIP calls for a year. The police, Serious Organised Crime Agency, HM Revenue and Customs and the Home Office would be able to access this data, although the Home Office would have to grant a warrant to police. The committee found that the draft Bill shows "insufficient attention to the duty to respect the right to privacy, and goes much further than it need or should". It also criticised the Home Office's failure to consult with internet firms and said that predicted costs of £1.8 billion are far too low. Lord Blencathra, chair of the joint committee, explained that UK citizens should not be made to feel like Big Brother and the Thought Police are watching them. He said, "There is a fine but crucial line between allowing our law enforcement and security agencies access to the information they need to protect the country and allowing our citizens to go about their daily business without a fear, however unjustified, that the state is monitoring their every move." As well as the obvious privacy concerns associated with ISPs storing your every online move for a year, deputy prime minister Nick Clegg slammed the cost of the project and the ratio of crime-fighting security to people's civil liberties. He threatened to block the Bill if it wasn't rewritten, saying, "The coalition government needs to have a fundamental rethink about this legislation. We cannot proceed with this bill and we have to go back to the drawing board." Labour agreed, with shadow home secretary Yvette Cooper telling the BBC that the government is "making a complete mess of a very important issue". All sides concede that the security implications are important, but as Cooper puts it, "this bill is too widely drawn, is unworkable and gives far too much power to the home secretary without proper safeguards". She added that the ISPs and other internet firms (like Twitter) have been little involved: "It is astonishing that the Home Office have had so little discussion with the internet companies who need to deliver this legislation." Other bodies welcoming the Joint Committee's findings include the Open Rights Group and the Internet Services Providers' Association (ISPA). Despite the backlash, the Tories are still pretty gung ho on the whole thing. Home Secretary Theresa May, who is pushing the Bill hardest of all, grossly oversimplified the matter by telling The Sun, "Criminals, terrorists and paedophiles will want MPs to vote against this bill. Victims of crime, police and the public will want them to vote for it. It's a question of whose side you're on." A Home Office spokesperson added, "This legislation is vital to help catch paedophiles, terrorists and other serious criminals and we are pleased both scrutiny committees have recognised the need for new laws. "We have now considered the committees' recommendations carefully and we will accept the substance of them all. But there can be no delay to this legislation. It is needed by law enforcement agencies now." "There can be no delay" did not sound very promising vis-à-vis rewriting the bill as per the committee's recommendations, but it looks as though May has been overruled. The prime minister's spokesman did not give any indication of a timeline for the bill's second draft but it seems unlikely that it will make it to parliament for consideration before late 2013.